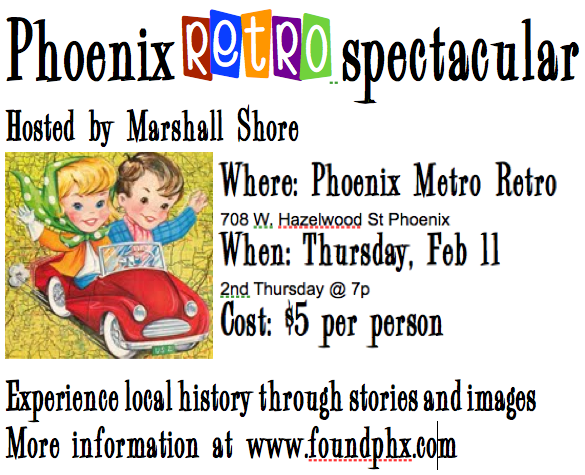 Best of Phoenix Marshall Shore: RetroSpectactular named by Phoenix New Times. 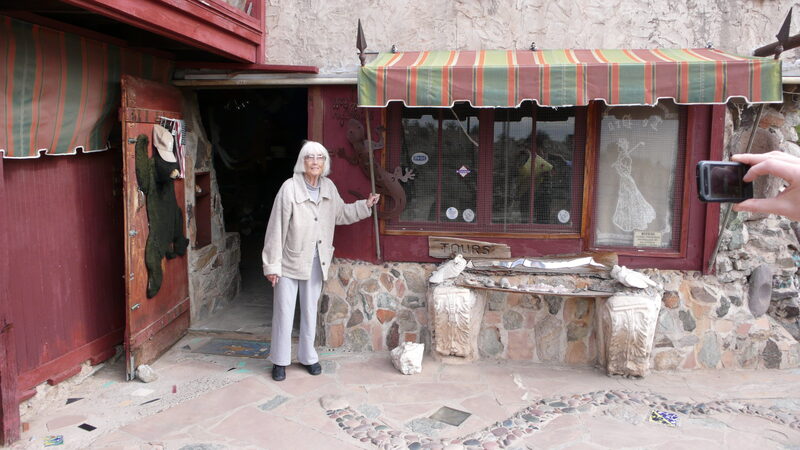 [caption id="attachment_269" align="alignleft" width="300" caption="Mary Lou at the Mystery Castle"] [/caption] Check out my post on Vanishing Phoenix about a local one of a kind icon, the Mystery Castle, and it's Princess who recently passed away. 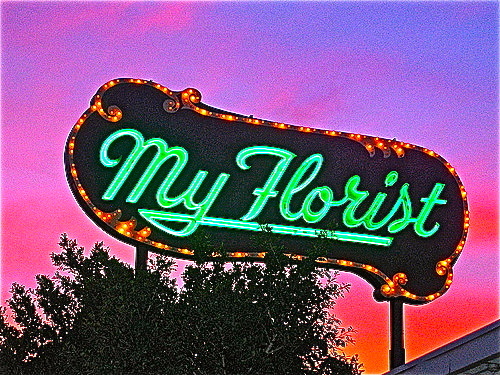 My Florist Cafe with that iconic neon sign [caption id="attachment_203" align="alignleft" width="450" caption="My Florist, Neon sign"] [/caption]recently closed to dismay of many. Ever wonder about it’s origin? My Florist was opened in 1947 by Vada Pearl Schwartz who became a local legend because of her flamboyant behavior and fondness for orchids. She was know to wear a purple dress with a purple orchid every day. If by chance she was not wearing an orchid your flower order was free. The store was purple inside and out including all the delivery vans. 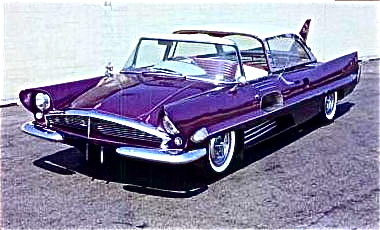 Speaking of purple transportation, she drove a one of a kind purple auto of the future circa 1950’s [caption id="attachment_202" align="alignleft" width="380" caption="Besasie X-2, custom built by Raymond Besasie of Milwaukee"] [/caption] Guess that explains the Purple background of the sign! She was also know for her unorthodox behavior, such as ride a on a horse into the flower shop and holding up the place. 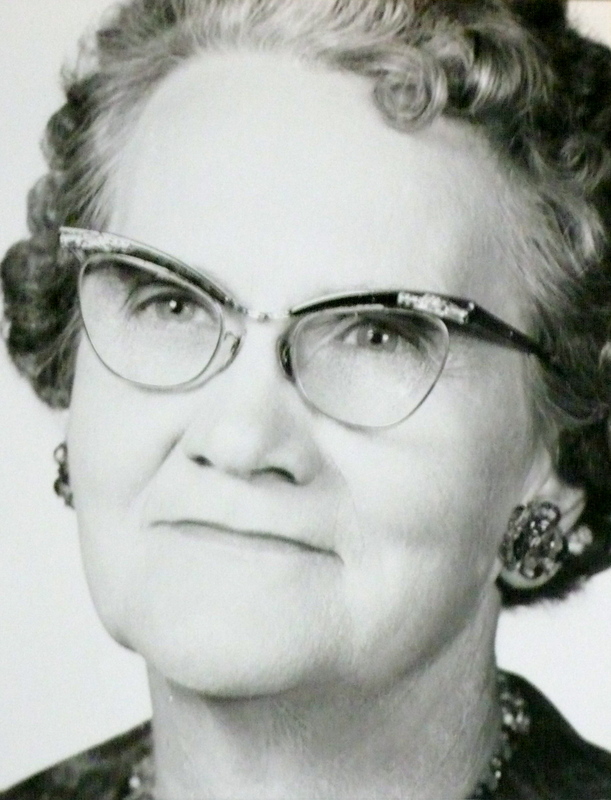 When Vada died in late 1966, her daughter Norma Brooking took over. Like her mother she ran until she too passed, but then the employees took over the store via a trust that Vada had set up. The employees ran My Florist until 1996 when it closed. Then part of the building become a favorite bakery in town Willo Bakery, leading to success of the restaurant that doors were locked and closed Oct, 2010. Even if you aren't old enough to recall their meteoric rise in the music world, you might be surprised how many of their recordings you have heard "M.T.A," "Tom Dooley," "The Tijuana Jail," "Where Have All the Flowers Gone?" 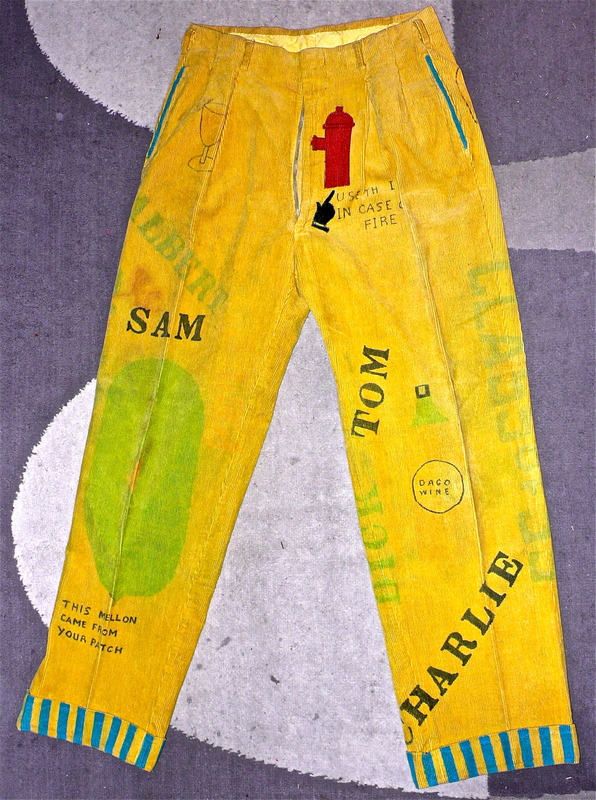 " and my favorite, "Scotch and Soda," Possibly more important than any individual songs is the fact that The Kingston Trio has been credited with the revival of folk music in this country. Bob Shane, the surviving founding member of Kingston Trio. 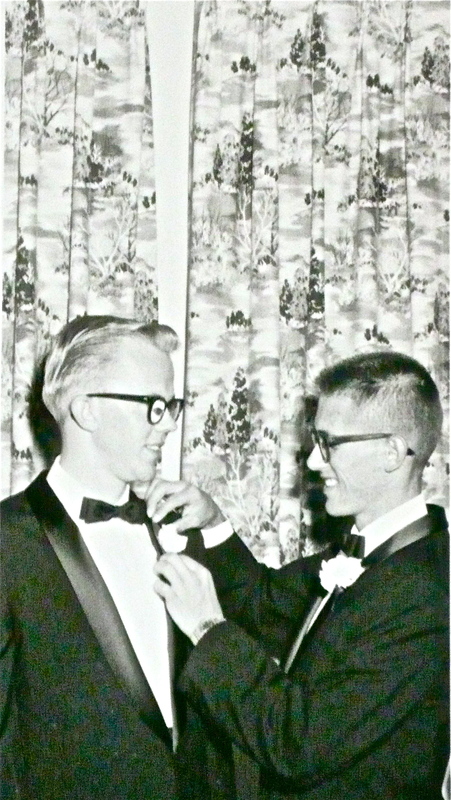 Bob 1934 born and finished high school in Hawaii, came to the mainland to attend Menlo College in California. 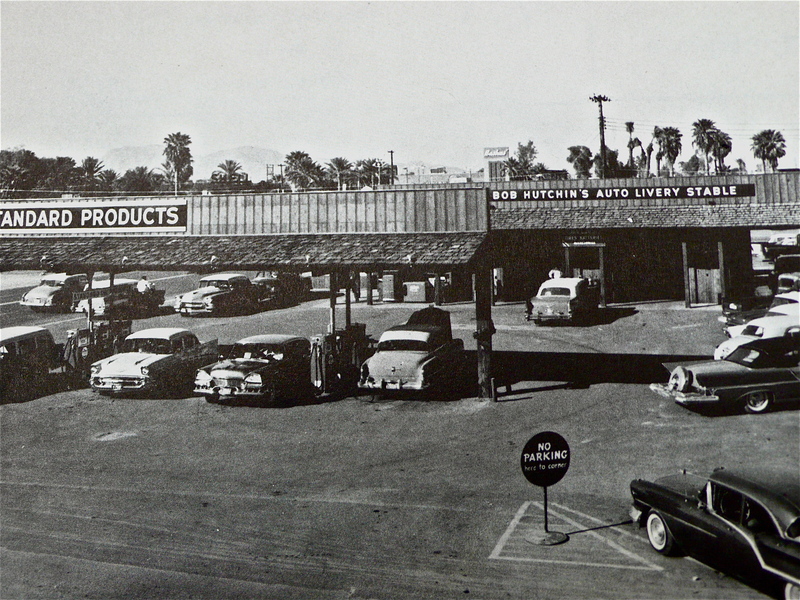 Bob returned to learn the family business in 1956, but was drawn back to entertainment. 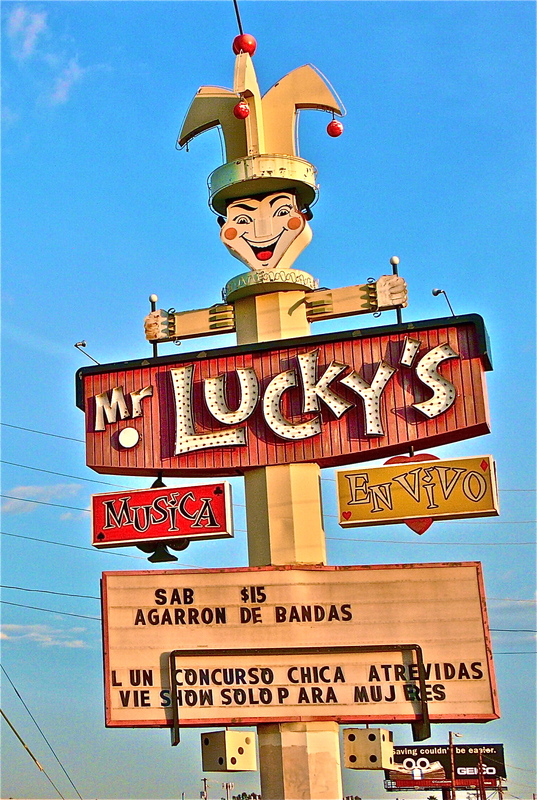 Performing on the island, he was billed as "Hawaii's Elvis". In 1957 he joined his high school singing partner Dave Guard and college friend Nick Reynolds to form The Kingston Trio. 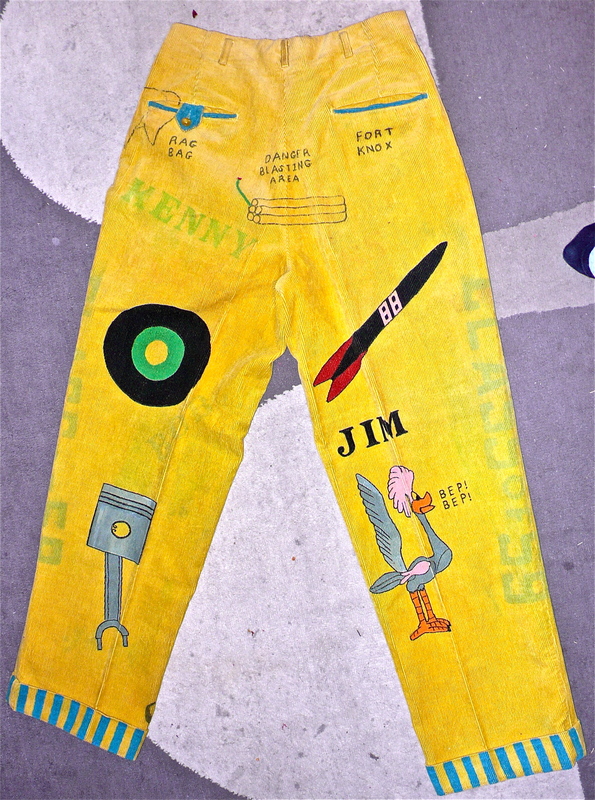 Bill Zorn born in 1948 and relocated to Phoenix, Arizona in 1961. 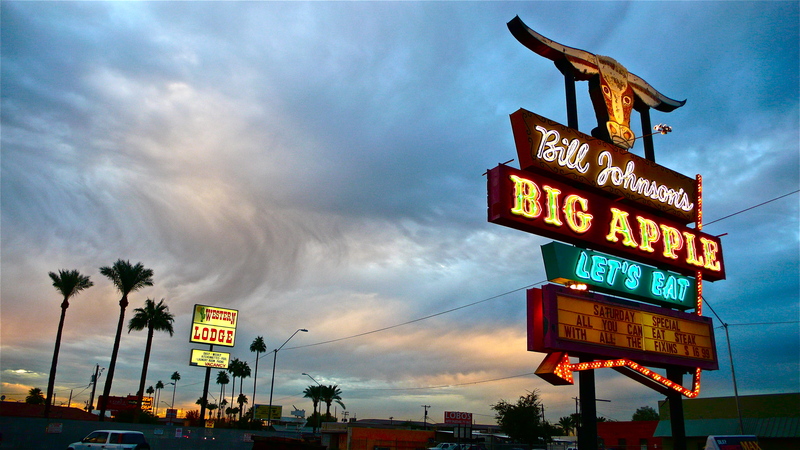 After studying music and drama at Arizona State University, Bill earned a place with The New Christy Minstrels where he performed, directed and toured. Then becoming a member of The Kingston Trio for three years. Leaving to work with his brother in England. After a successful career. 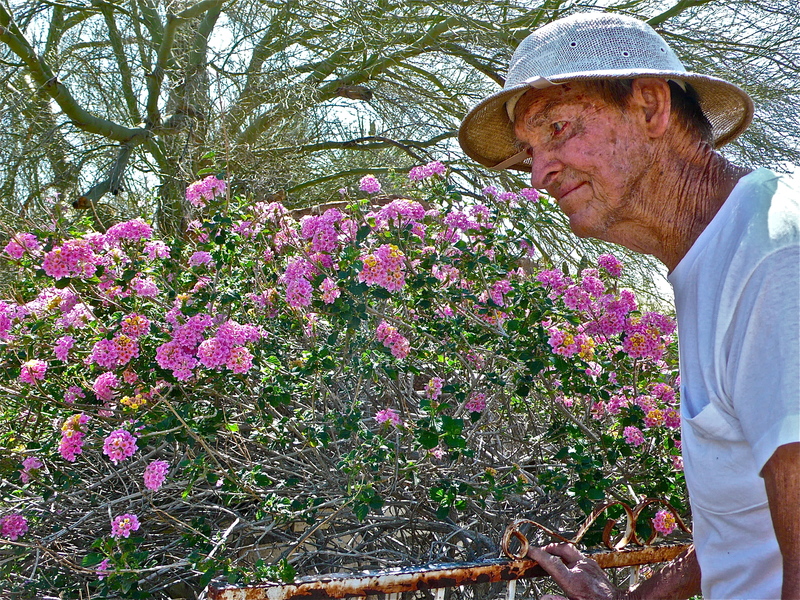 Bill and his wife Jo had the opportunity to move back to Phoenix, and Bill currently performs, with friends, as a member of The Kingston Trio. Young Men in a Hurry unaired pilot, filmed in 1963 on location in Phoenix and at Paramount Studio. 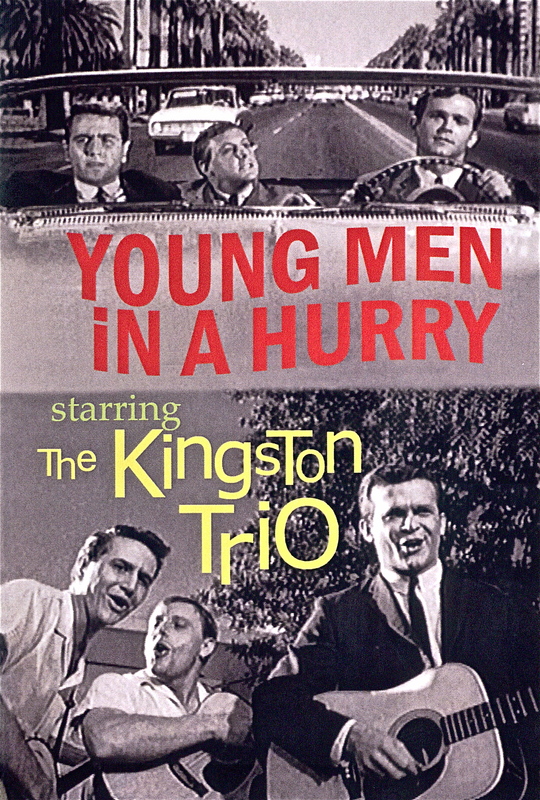 Featuring the Kingston Trio portraying recent college graduates who are close friends and roommates (at the Martinique.) 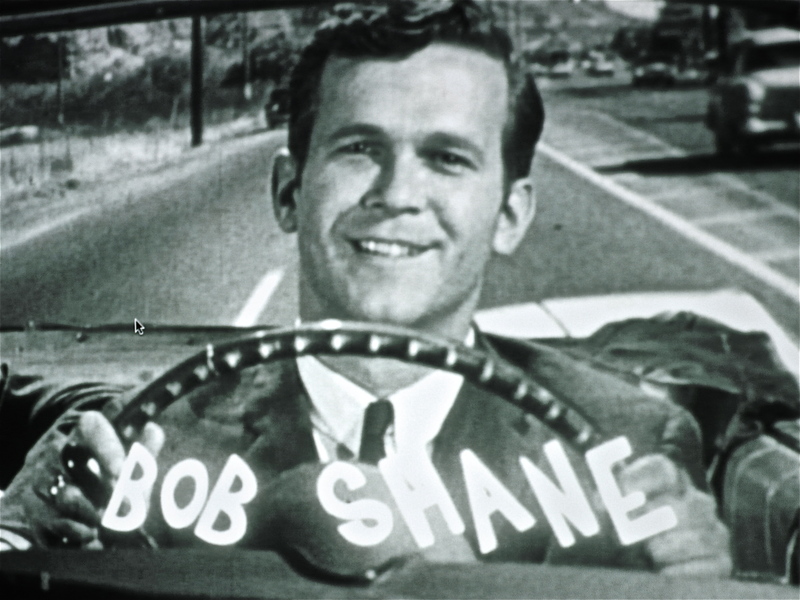 Drive down Central in a in a convertible, with John the lawyer, Nick a real estate salesman, and Bob is featured as a bank teller whose current job is a source of tension between him and his rancher father (protrayed by Ted Knight who would later gain fame on “the Mary Tyler Moore Show” as Ted Baxter). The three fellows trade on their status as members of the Junior Chamber of Commerce to play music together as a means of making extra money. "Oh Miss Mary" and "Goin' Away For To Leave You" are featured, along with the Trio staple "Coplas!" and the unreleased John Stewart-penned theme song, "Young Men in a Hurry." Yes day four of my personal 21 day blog-a-thon! and still going strong. What a great day today has been. 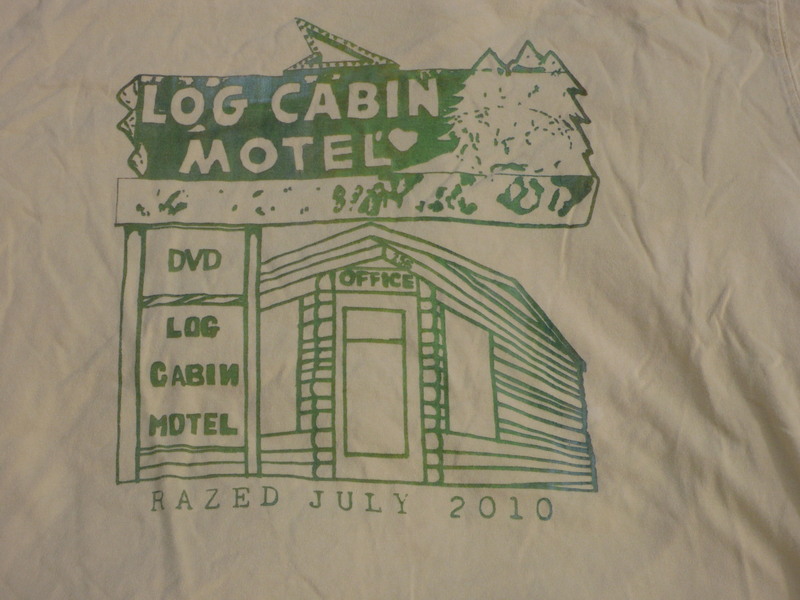 It would have been easy to go print some t-shirts or work on something else, but OMG exciting stuff. Began the day at Lux, they really great espresso on the rocks and brioche filled with black berries, No pic because I ate it (YUM.) Ran in Taz and we had a quick talk about before my meeting with Jody Crago a Museum Director in Chandler. We talked for quite a while about the stuff he cool stuff he is planning and the intersections of stuff I am doing with AZ History and building community. 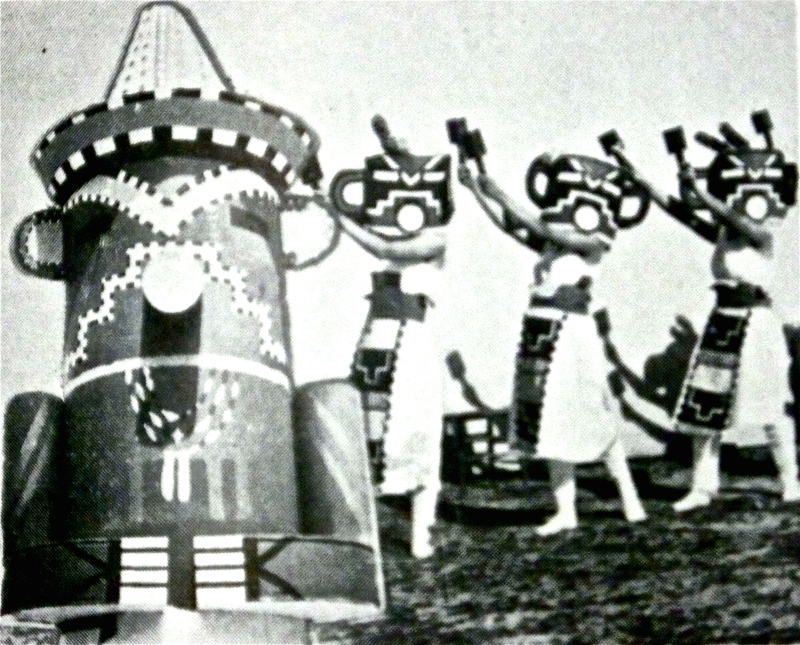 I mentioned Masque of the Yellow Moon and that in 2011 it will be celebrated at Trunkspace and Chandler. 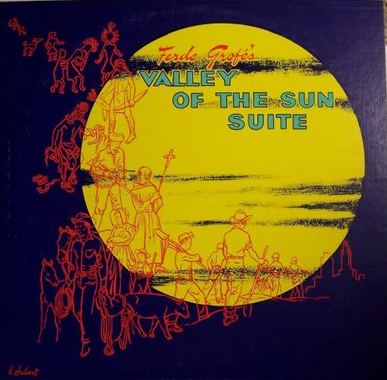 I just found a copy at lastfm and here is a free link for it here. 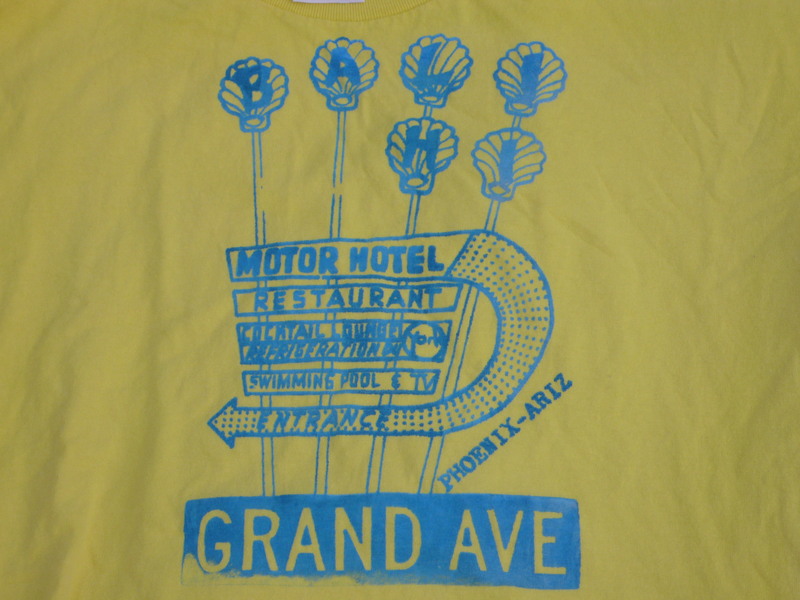 So there will be a recreation of the MYM next Spring on Grand Ave and very likely in Chandler! 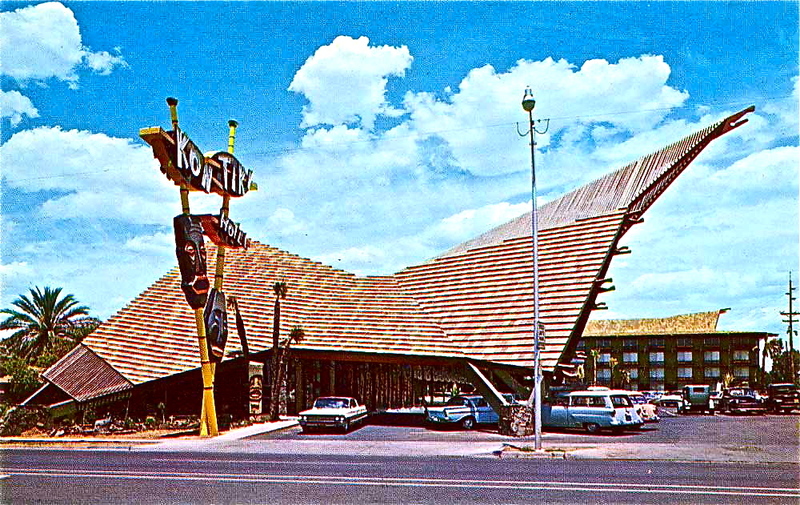 This is 50's Phoenix! 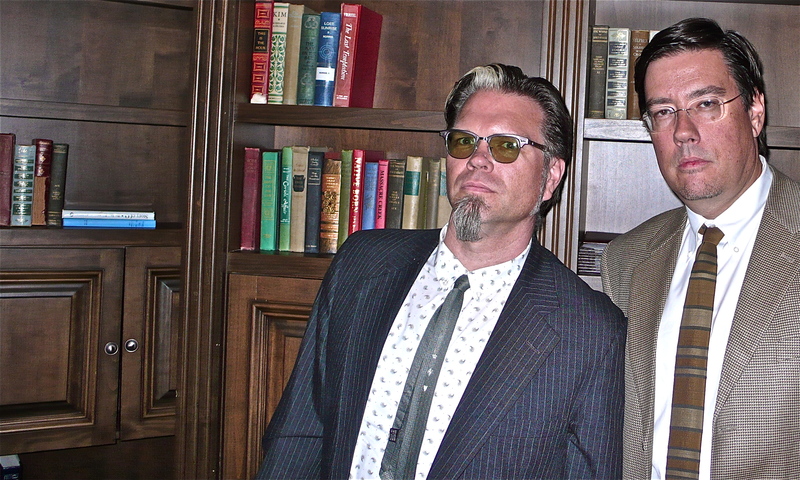 a slight scent of mafia still lingering on the red flocked wall paper. Last night I traded my tuesday night ritual for Radiate Phx, normally I would have done both, but that additional manhattan put the kibosh on that. 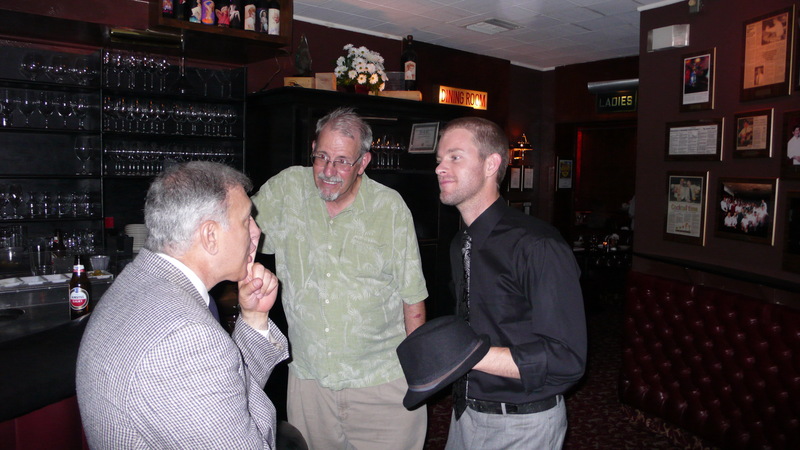 We met at Durant's which is celebrating 60 years of business. It's a great networking mixer with some many diverse folks and bartenders that make mean drinks, free pour. With the air of old deals that were made there I am sure new deals were discussed among the crowd. 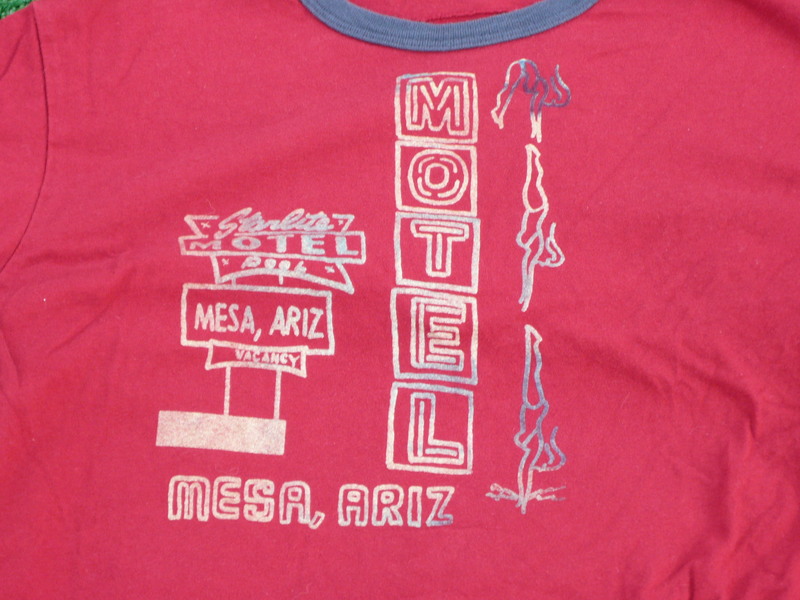 Mine included PK, Phx design week, my art work, business ventures, and how the Valley is a so just do it type of place. 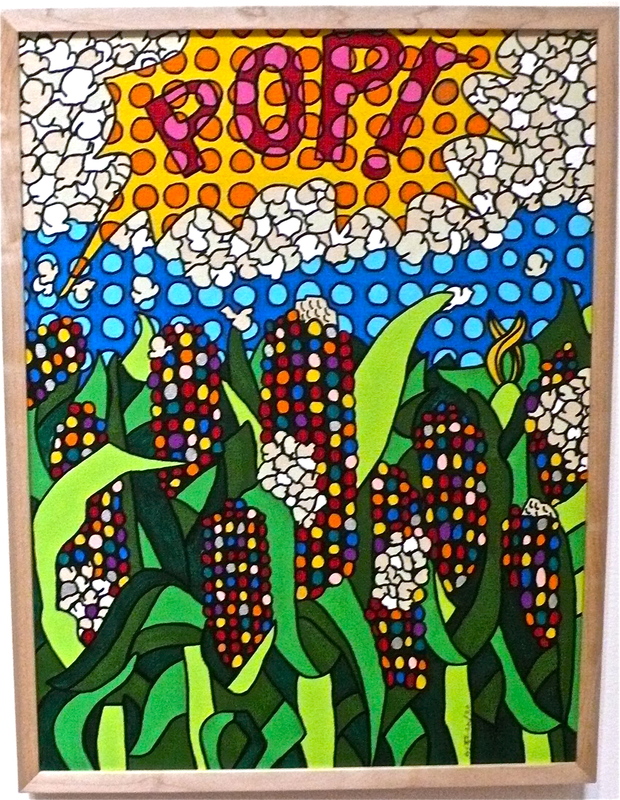 A while ago I received a phone call from the Heard Museum, about performing a Retro Spectacular during third Friday for the POP Art show. Kate Crowley from the Heard introduced me to the exhibit and fell in love with the exhibit. It brings the art/ fashion/ jewelry into a modern context and compares POP artist like Warhol and Litchenstien to contemporary Native artist. Fast forward to 3rd Friday at the Berlin and a packed house filled to standing room only. 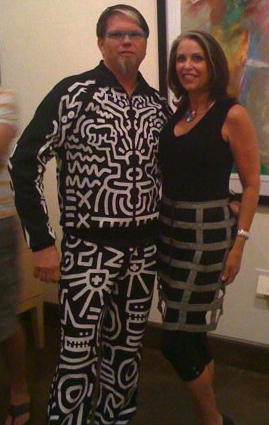 Walked in wearing a Keith Haring track suit. 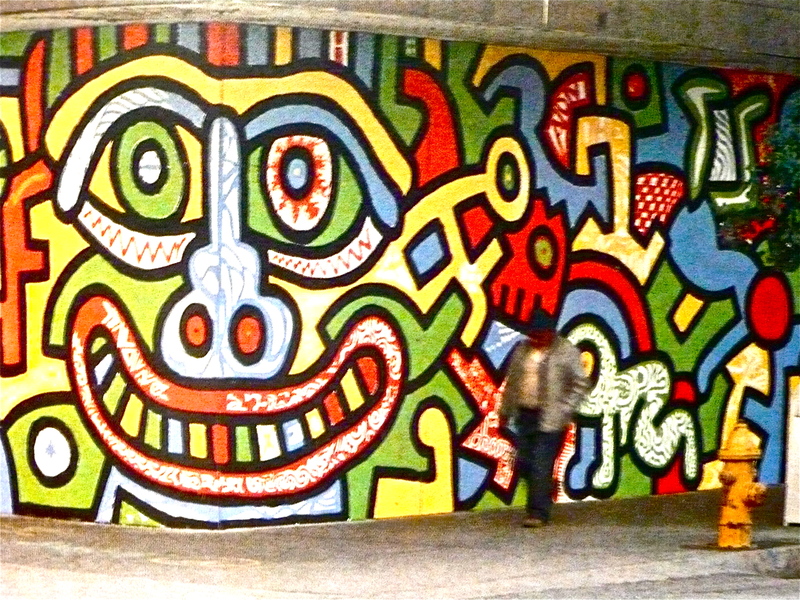 I must say that I had worn the jacket before, think that the pants were a bit over the top, but it felt amazing to be enveloped in Haring graffiti. Jumping feet first in to the mural that he painted in downtown Phoenix on the boarded up windows of a Woolworth’s. 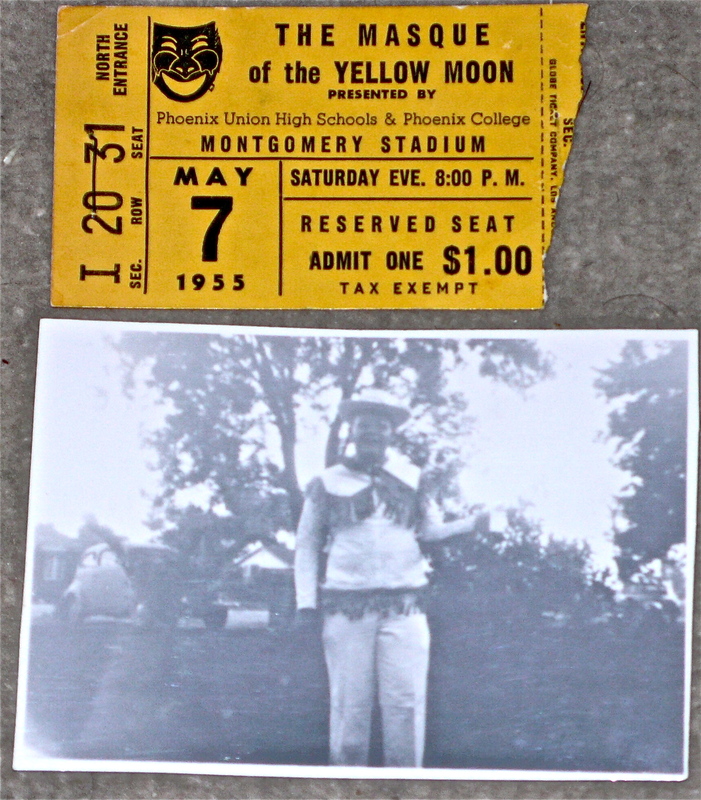 to one of my current passions Masque of the Yellow Moon that will be appearing with more information and really cool developments [caption id="attachment_134" align="alignright" width="300" caption="Montgomery Stadium @ Phoenix Union H.S."] [/caption] There will be more on the MYM coming. Some really cool developments! Kelly Paisley of course being in hot pursuit of saving Beefeater's asked to speak the manager and told Mickey how much we liked the place and learned of it's former life as a Packer's bar. 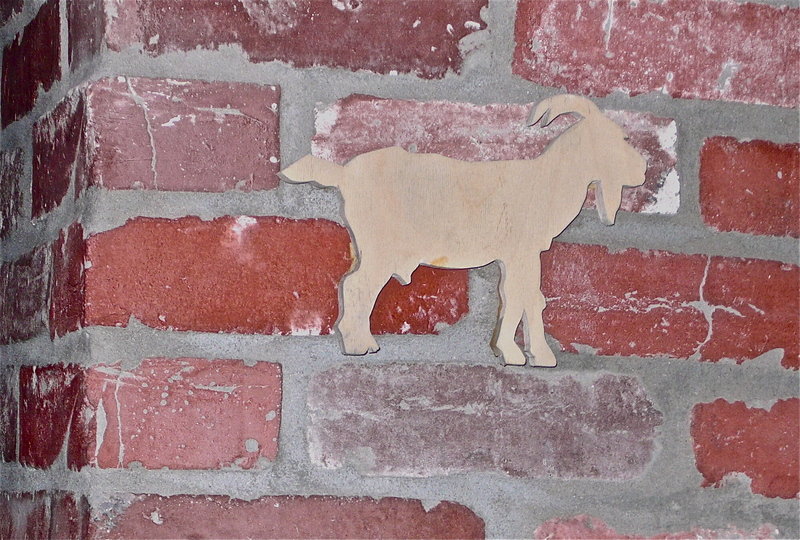 We learned that the goat, or patron saint and image heavily repeated was found during the removal of the sport memorabilia. 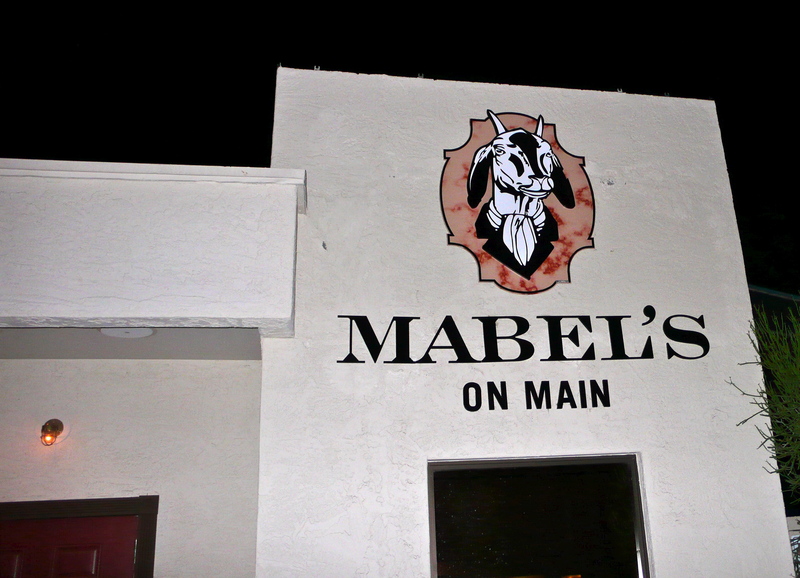 So there you know how I spent the night with a goat. I also alluded to a new leaf. While catching up with Kelly and Steve I realized how much is going on in adventure filled life. 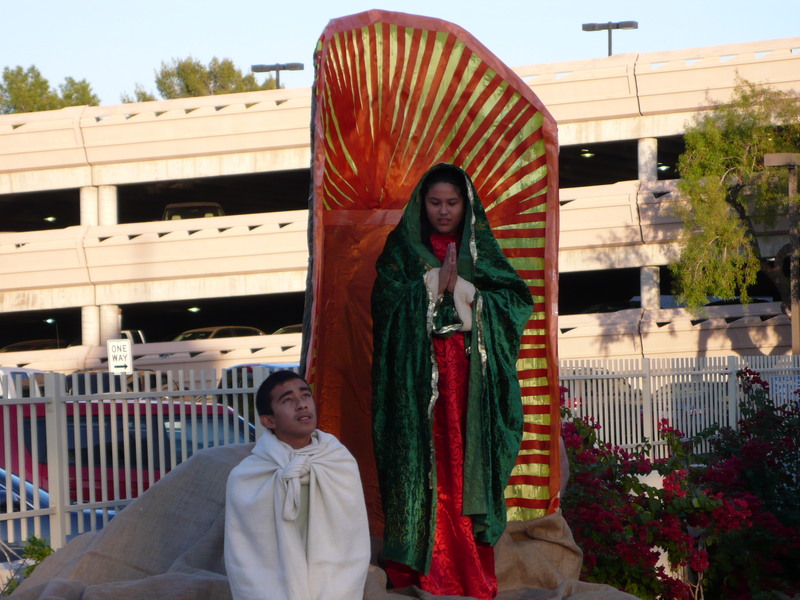 Cut to a recent event where I was talking with Tony Arranaga the lightrailblogger and lamenting my lack of blogging. He mentioned it takes 21 days creates a habit, so I challenging myself to blog for 21 days and create a habit. My life on the screen. 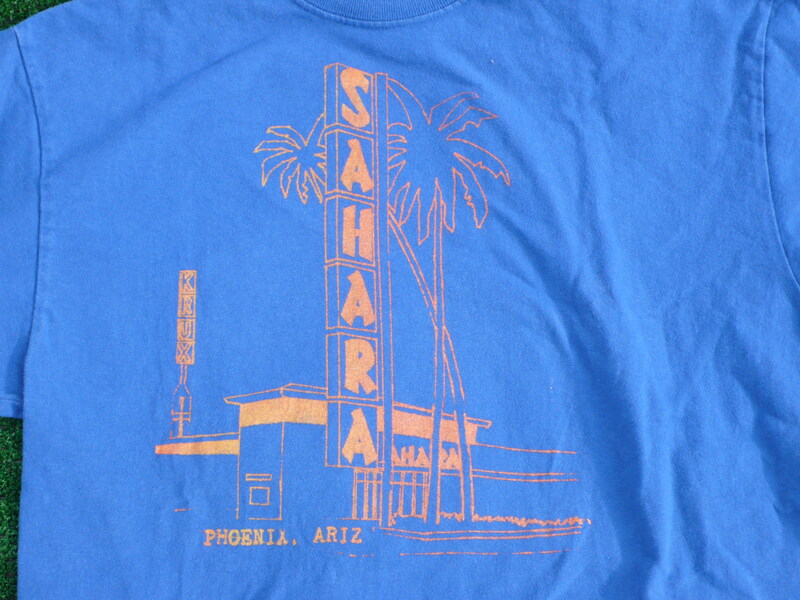 I presented at Phoenix’s First PechaKucha, 20 slides x 20 seconds each. Title: Bursting Off the Shelf: Interior Design for Information Access. It was a sold out crowd and a wide diverse group of presenters. Used my Flip camera to record the presentation and here is the link to Vimeo. Enjoy! 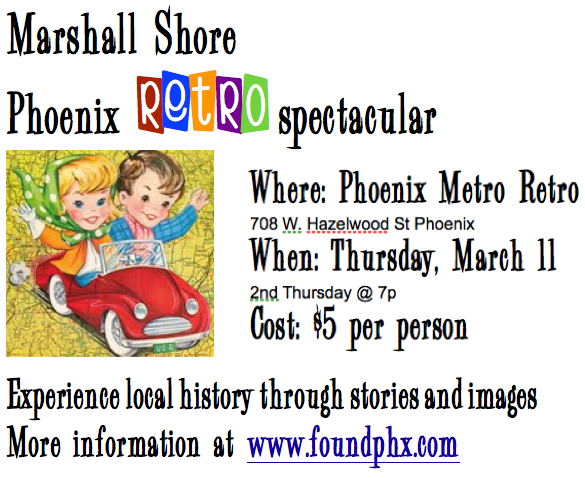 PechaKucha Phoenix from Marshall Shore on Vimeo. 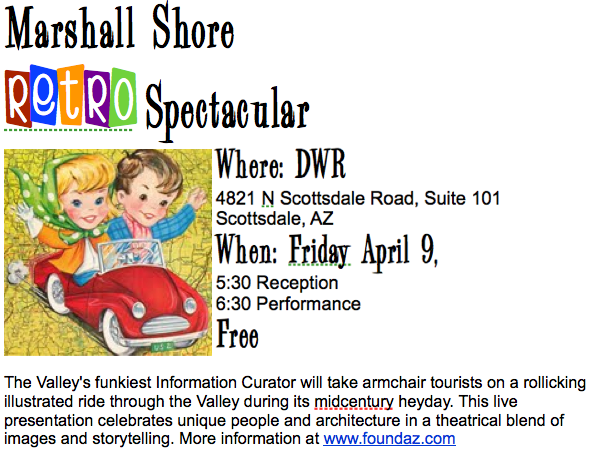 What did you miss at the April, Marshall Shore: Retro Spectacular? 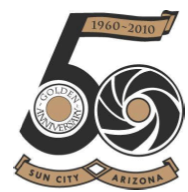 Sun City Celebrates 50 years. 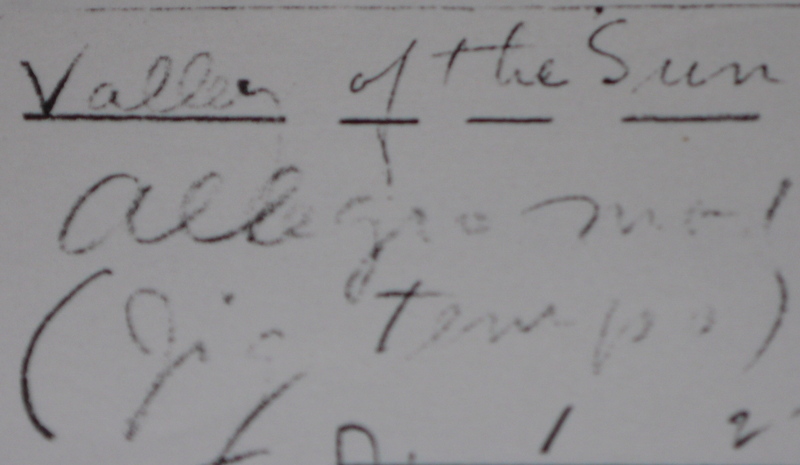 I highlighted that on Sunday, May 16th you can join the Sun Cities and I for a theater presentation of a woman portraying his secretary and birthday cake. 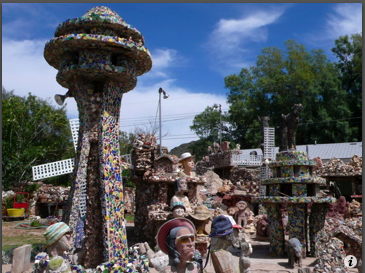 Thompson Rock garden is a Sunny Slope paradise that is folk art sculpted from rock, concrete and other items. 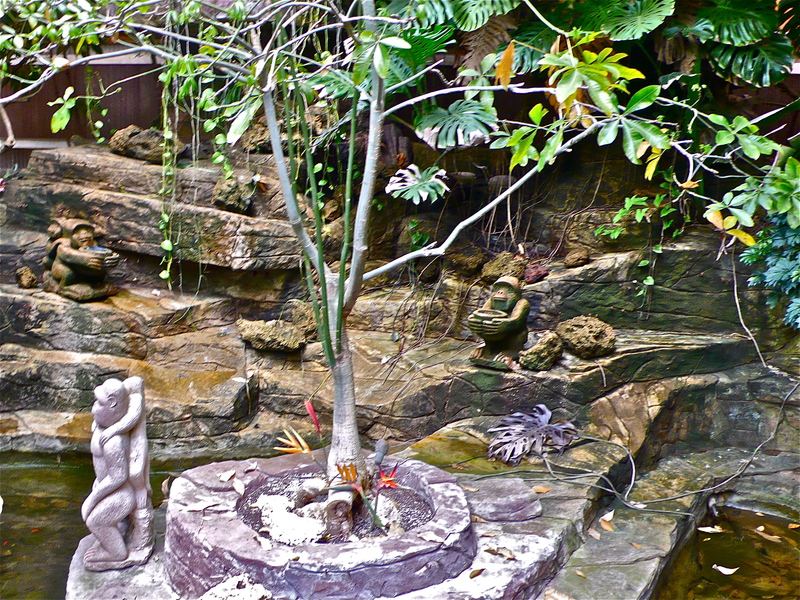 I had pleasure of meeting the woman who lives there now, she opened the gate allowing for a close up view. Boojum Tree, which is a fantasy place that evokes old Mexico and a hidden jungle atmosphere. 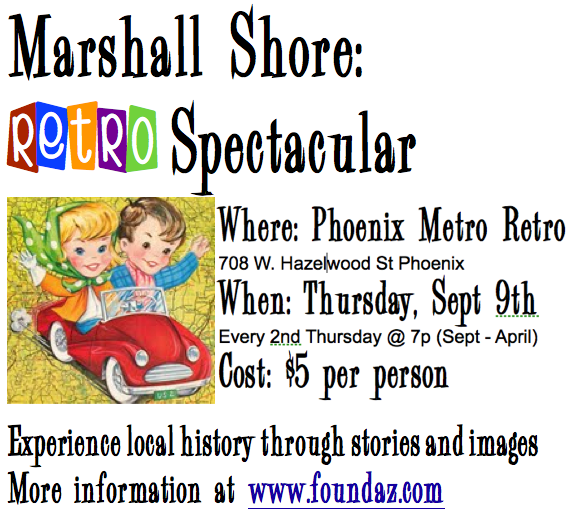 You will not believe your eyes or ears at the next amazing Marshalll Shore: Retro Spectacular. April brings us two special presentations! 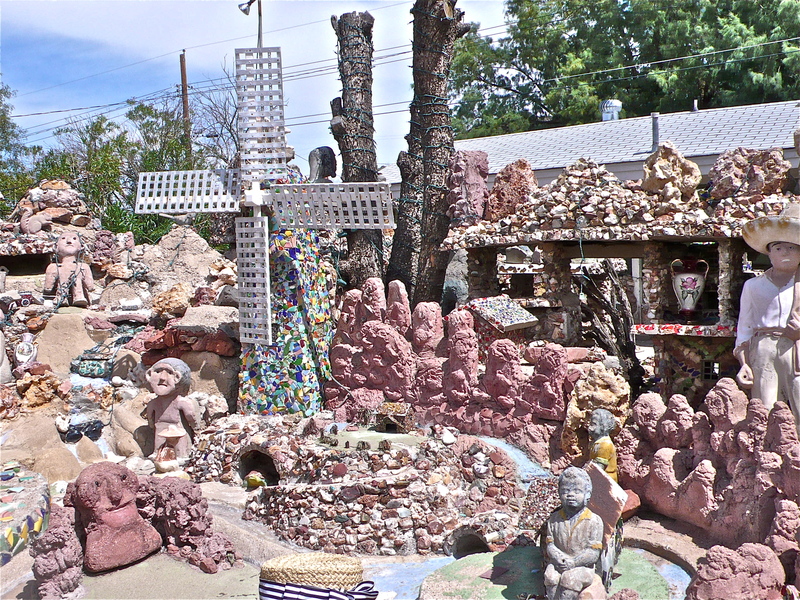 Come learn about the Thompson Rock Garden, Building Materials Museum, and the Howdy Dudettes? To Many things to mention here. My day began with lunch Los Reyes De La Torta in Sunny Slope with the delightful Christina Plante. Coffee was nice displayed on arrival with the wafting scent of cinnamon. YUM The hongas (mushroom) quesadilla was tasty and large. Paul enjoyed the leftovers and NOW wants to go! 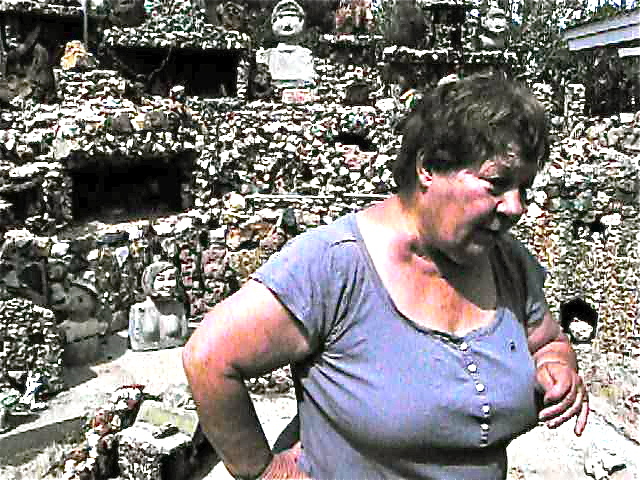 We made our to view the Thompson Rock Garden from the inside with Miriam the current own of the 50 year old garden. 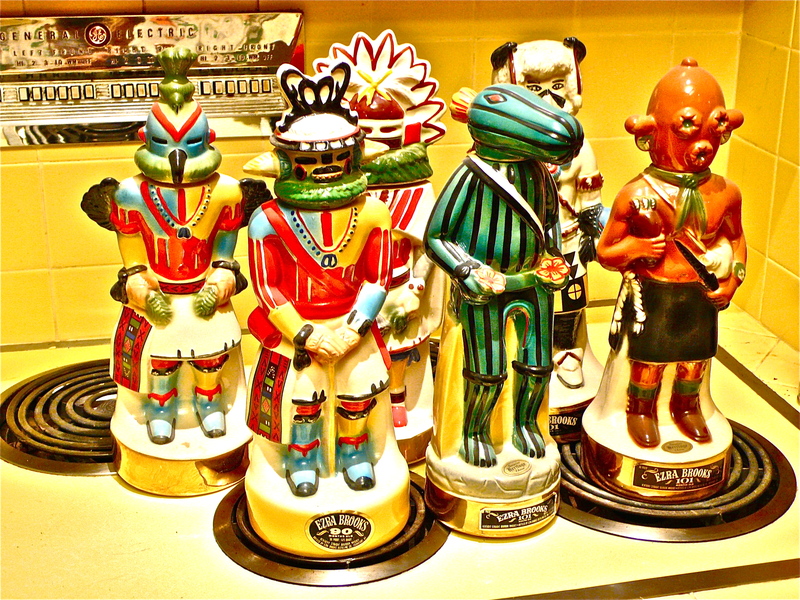 When Miriam mentioned that her friend Gus had a great collection. Now to find something more fantastic there was bit of a drive. Most shocking was the coming to a culda sac and continuing on. We arrived at Gus Building Material Museum. 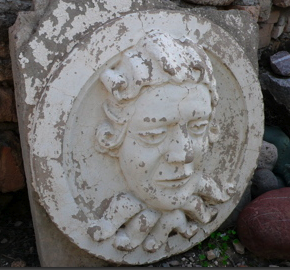 My jaw dropped and I got to touch a medallion from the old Fox Theater in Downtown Phoenix.